This order form is for all US orders. If you are submitting an order for a German school or community, please click here. If you are not from the US or Germany, please email us directly to inquiry about purchasing a kit. 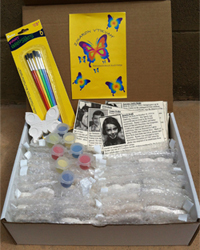 Our kits include materials for 36 individuals to participate, including 36 ceramic butterflies, 36 biography cards, 36 paint brushes, and glazes for 36 participants. If you are in the San Diego area and available to pick up kit(s) from our office, you do not need to pay for shipping. If the Education Team will be visiting your school or organization, they will bring the kit with them. Please tell us how you will receive your kits. I will need my kit(s) shipped to me. I will pick my kit(s) up from the office in San Diego. Thanks to generous funding from our donors, we are able to subsidize the special Educator rate and waive the Licensing Fee when a kit is purchased. These rates are reserved for teachers and other school administrators.